The Information contained in this booklet is for educational purpose only. It is not to be considered medical advice -- diagnostic or prescriptive. See your doctor for qualified health care professional care. 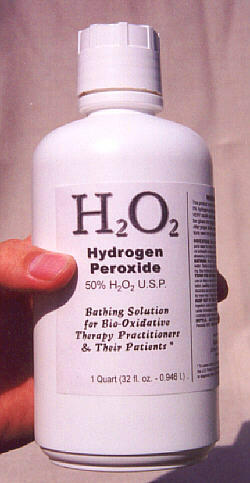 aking hydrogen peroxide as a bathing solution presents, for many who are concerned about the risks involved in taking H2O2 internally, a sound alternative for obtaining the benefits of "bio-oxidative therapy." External use of H2O2 is approved in even the most "health care repressed" countries of the West (including the U.S., Canada and U.K.) The technique is very simple: carefully pour 8 fl. oz. (about 240 ml.) into a full bath of water. Even if you have a small tub, the resulting solution will be far lower than the H2O2 3% available in most drugstores. The user soaks in this warm water for 30 - 45 minutes per bath (you may wash up as you normally would when taking a bath after this 30 - 45 minute soaking). This is also cost effective: one bottle (at $9.29) compares favorably with prices elsewhere on the internet at $20 or more for a quart - of H2O2 35% (which is 15% more diluted with water). At 8 fl. oz. per bath, this is enough for 4 "treatments." Understanding dilution: To grasp the dilution factor involved in "store bought" H2O2 products: One bottle of our H2O2 35% is the equivalent of 4 gallons (512 fluid ounces, or over 15 liters) of H2O2 3% -- or 32 standard 16 fl. oz. bottles, which normally run well over $1 USD each! The retail bottles would have to sell for $ .35 each to be comparably priced. (1) Emergence of Worms / Softening of Stool. Even a casual examination of one's stool following one or two H2O2 baths will reveal the presence of dead intestinal worms, or other parasites, in the stool. These are usually identifiable by shape and color. The most common, identifiable parasites will appear shaped like polywogs. Colors can vary from white to a reddish-orange. Even if you can't identify specimens, as such, you WILL notice changes in the color and texture of your bowel movements, as parasites as well as toxins are released that have been unexpelled, sometimes for many years. (2) Signs of "Healing Reactions". People who have not bathed with hydrogen peroxide before will encounter "healing reactions," which, without a thorough understanding of peroxide's healing effects, may be mistaken for prodromal, or early disease symptoms, if not the onset of sickness. These may include fever, diarrhea, or other flu-like symptoms; skin rash, boils, red spots or botches on the skin that can, in extreme cases of detoxification, take the appearance of a form of tinea. Many healthy people will experience none of this. But others, particularly those with advanced diseased states - and this includes many cancer cases, will experience healing reactions. Sometimes these reactions will not appear after one or two baths -- they may appear after using the product for a month or two. Some of the staff at Alpha Omega Labs use H2O2 for maintenance purposes only, and sometimes healing responses will "kick in" after three or four months of use. There are no patterns here, as response to peroxide bathing is highly individualistic. The important thing to remember is that serious detoxification, which brings about the purification of physiological systems, will almost always be accompanied by healing reactions. Try to keep in mind that "something good is happening." As always, if conditions persist, you can always consult with the physician of your choice, if you so choose. It usually takes years of abuse for your body to reach a disease state, so give it at least a little time to restore you to health. (3) Changes in the Skin. Apart from "healing reactions," less dramatic changes may be noted in the skin: some people feel their skin become temporarily "drier" in the early stages of use. Most people notice that, in time, the skin is generally softer and feels "cleaner" after they have used H2O2 for a few weeks. As with healing reactions, these are nothing to be concerned with. The skin is the largest organ of the body. It is your first line of defense against a hostile environment of airborne toxins, microbes, parasites, and filth. Some people observe small insects coming out of their skin during some of their baths. Remember, you can pick up parasites even from your house pets - and many parasites, such as lice, make their home in your skin. So getting rid of these pests should be a welcome sight, and not something to frighten you. (4) Long-term Responses. Some responses you may observe that occur with regular use of H2O2 bathing over a longer period of time (i.e. over 3 months) will include: the elimination of scar tissue; the return of your regular hair color (i.e.  gray color going away); or even the elimination of chronic problems (i.e. backaches, ulcers, etc.) that exist at sub-clinical levels - conditions you may have just tolerated for years because no permanent solution was available. It should be quickly noted, however, that these responses are widely reported but are, by no means, universal. Some individuals get all or some of these responses from longer term use, but there is no way to predict in advance who will and will not experience them. About Taking H2O2 Internally In answering this question, please be aware that laws concerning H2O2 usage vary from country to country. Generally speaking, the U.S., Canada, and most of the countries of the British Commonwealth (i.e. Australia, New Zealand, etc.) discourage the medical uses of H2O2 as anything but a topical antiseptic - and even then at a diluted concentration of 3%. In fact, they "poo-poo" the entire field of "bio-oxidative therapy," and many doctors are taught to view it as pure quackery. On the other hand, as we've noted elsewhere, countries such as Russia, Germany, Austria, Switzerland, and Cuba have medical communities where it has not only been accepted, but on a governmental level, it has been pursued openly and with enthusiasm. We have chosen the middle ground in this debate. Our view is that the internal use of H2O2 and other bio-oxidative products should be left to medical practitioners. We choose this view for two reasons: first, an experienced practitioner can fine tune the proper protocol that will be right for you, based on their experience; secondly, you may have reactions that would best be monitored by a medical professional, thus avoiding potential pitfalls of "going it alone." The choice, of course, is up to you and your decision will also be dictated, in part, by where you live and what level of professional care is available in your area. At the least, however, our view should be taken into account in whatever you decide to do. andling any high concentration H2O2 (or even above 10%) demands attention to safety. There are "safety guidelines" you can read in the links and article in the right column, but because of the importance of stressing this point, we will bring it up here. 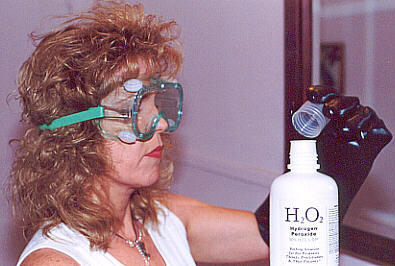 We advise customers to use both goggles (to protect the eyes) and rubber gloves (to protect the hands and arms)in handling even the H2O2 bottle. You should not pour the H2O2 into your bathtub until it is about halfway full - in doing this you are ensuring that upon pouring H2O2 35% into the water, you are getting a quick dilution down to a safe, non-caustic level. Spill, Swallow, or "Get It In Your Eyes" Maybe we're just uncoordinated klutzes, but our own people, even those who have used highly concentrated H2O2 for years, find spills on their hands to be fairly common. This is no big deal. 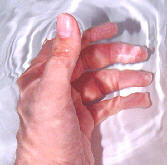 Just submerge your hand or other exposed area in water for about 15 minutes or so. Dilution to non-caustic levels takes care of the problem and you will notice the "white spots" that H2O2 exposure creates go away - usually quite quickly. What is far more serious is accidentally swallowing H2O2, in which case you should seek immediate professional care (see panel at right), or getting it in your eye, in which case you should IMMEDIATELY wash your eyes with water to dilute the peroxide down. Whether you will need medical attention is largely dependent on what amount of H2O2 you managed to get in your eyes. Want to play it safe? Wear those goggles & gloves! H2O2, and its partner, ozone, are well respected in the field of "bio-oxidative therapy" in countries throughout the world. It only stands to reason that the internet would be full of helpful sites to help you educate yourself on this valuable health care tool. Again, please note that our recommended use of H2O2 is strictly for bathing, unless your health care professional recommends otherwise. Also, in the name of fair play, we include links below that spell out the views of bio-oxidative therapies as held by the orthodox community, including official statements by the U.S. Food & Drug Administration. The Many Uses of Hydrogen Peroxide -- Truth! Fiction! & Unproven! WARNING - CAUSTIC! This product is over 16 times more concentrated than the 3% hydrogen peroxide available in most drugstores. It is VERY caustic and container should be handled with rubber gloves and goggles to protect the eyes and hands. After proper dilution with water (see below), these precautions need not be observed. INDICATIONS: Dilute this solution, one part 35% H2O2 to fifteen parts water to make a 3% H2O2 solution suitable for use as a topical antiseptic to help prevent infection in minor cuts, burns, and abrasions, or to cleanse the mouth. DIRECTIONS FOR BATHING: Pour 8 fl. oz. (about 240 ml.) into a bathtub of warm water. Relax in the bath for at least 30 minutes prior to any cleansing. See herbhealers.com/h2o2bath.htm for further info. PRECAUTIONS FOR EXTERNAL USE: Do not use in the eyes. If redness, irritation, swelling or pain persists or increases or if infection occurs, discontinue use and consult your physician. KEEP OUT OF REACH OF CHILDREN! In case of accidental ingestion, seek professional assistance or contact a poison control center immediately. STORAGE: Keep bottle tightly closed and at controlled room temperature 59-89° F. DO NOT SHAKE BOTTLE. Periodically loosen cap to release free oxygen and relieve pressure on the container. Store in a cool, dry place. ACTIVE INGREDIENT: Stabilized Hydrogen Peroxide 35%. ALSO CONTAINS: Purified water.